The last of the asparagus was cut from the 4 by 8 bed and it was prepared for production in 2019. Th surface weeds were removed. A bit of 20 20 20 pellet fertilized was sprinkled. The bed was covered in a 3 inch layer of mulch. The growth will be ferns, which will be cut late Fall when they turn color yellow. This little bed produced 5748 grams or 12.67 pounds from May 4 to 27 May. 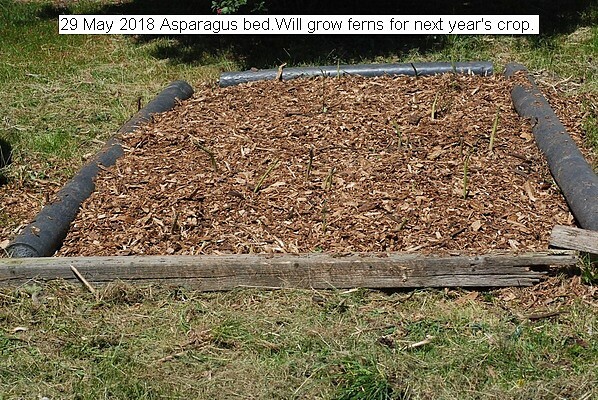 This entry was posted in Uncategorized and tagged 29 May 2018 Asparagus, 29 May 2018 Asparagus Bed Finished for 2018, 29 May 2018 Asparagus12.67 Pounds produced.. Bookmark the permalink.